Weather conditions were excellent: mostly sunny skies, temperatures in the 60s with a slight southeast wind. Girls co-captain Becca Kisner ’08 said that “It’s really great to sweep again, our confidence from last weekend’s wins definitely carried into today’s racing.” However, the captains and coaches have reminded everyone on the squad that now is not the time to fall into complacency: “Now that all the rowers have seen how much our hard work has paid off, we’ll be raising the bar and pushing people to get faster for upcoming races.” Kisner also remarked she is “very proud of the younger girls for stepping up and racing at a really competitive level.” Video footage of the G1, G2, and G3/G4 races are available on YouTube, courtesy of Chris Hanlon, P ’10. 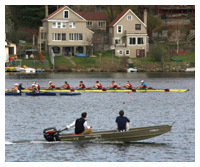 Next week, crews will head to Hanover, NH to race Hanover High School on Dartmouth’s racecourse. Please e-mail me if you would like to take photos of next week’s races since I won’t be able to attend them. Update: Streaming video of the G1, G2, and G3/G4 races are available on YouTube, courtesy of Chris Hanlon, P ’10. Update 2: Full resolution video of all races is now available for direct download here (118MB).